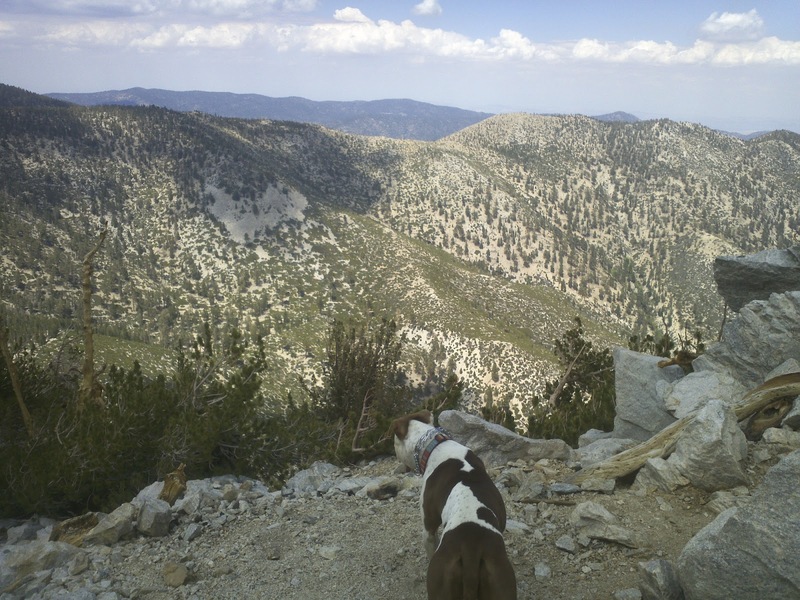 We backpacked Mt San Gorgonio last weekend with Dakota. 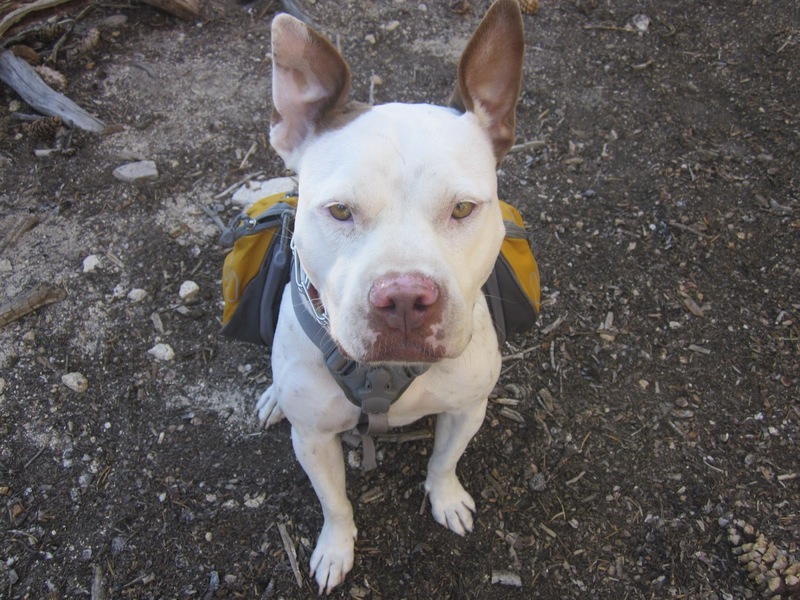 It was her first backpacking trip and she finished the entire trip like a champ! Louis, Peter and I left Saturday morning at 5AM, Mt. 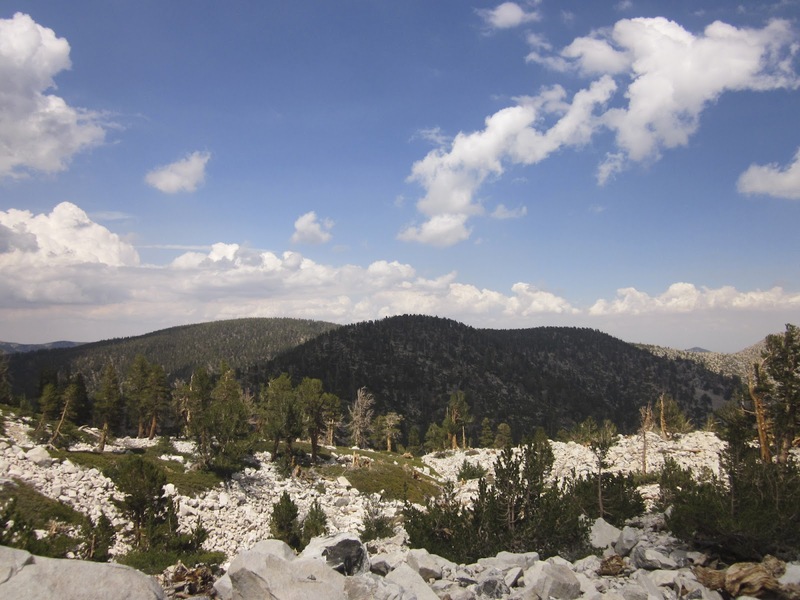 San Gorgonio is located near Redlands by the 215 and 15 freeway. 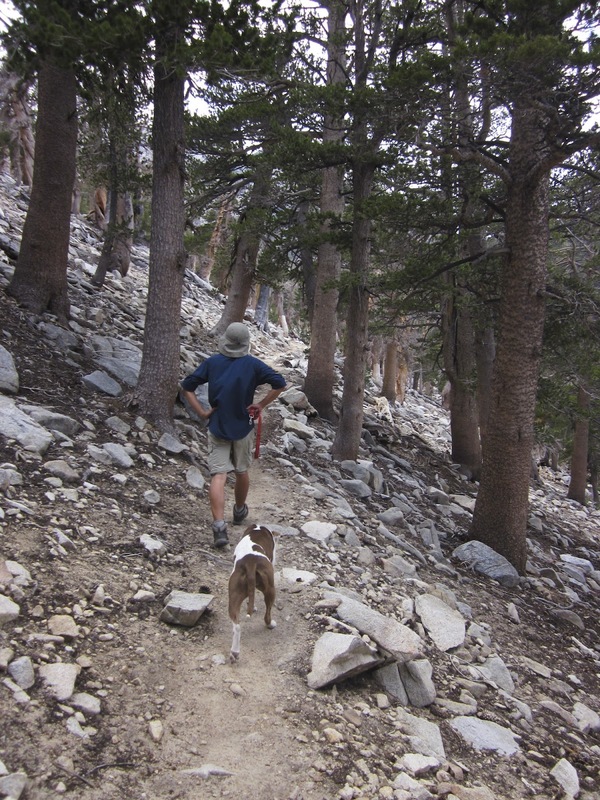 It is within the San Bernardino National Forest so dogs are allowed on trail. 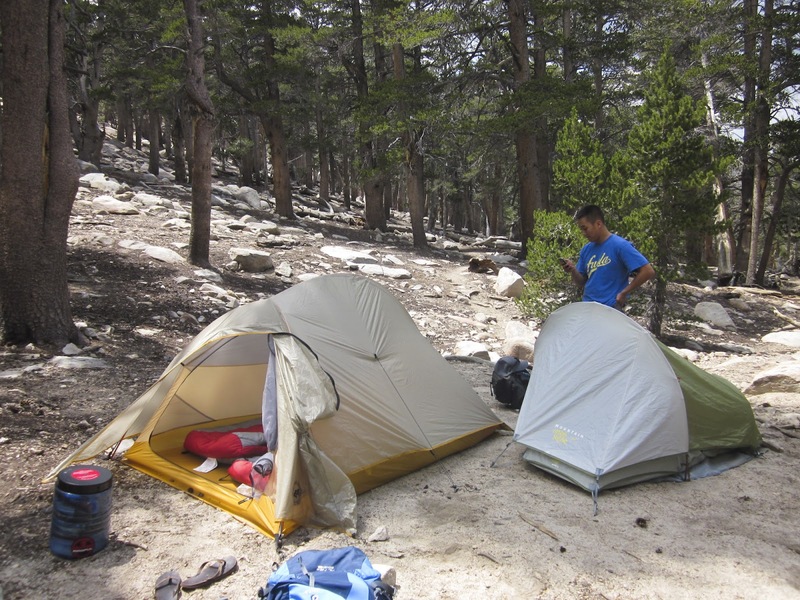 A permit is required for overnight camping, we had to fax in the permit to the ranger’s station 5 days before the hike. We arrived at the ranger’s station at 8AM and picked up our permit. 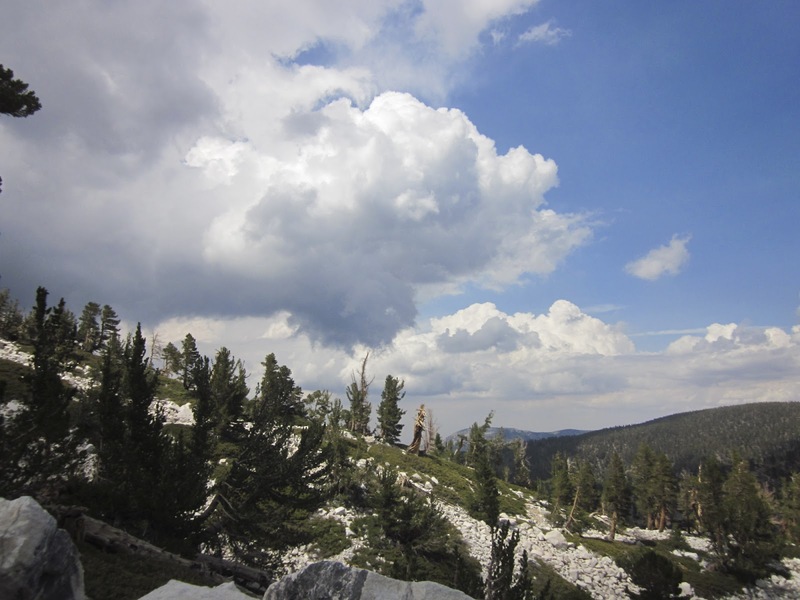 The drive from the ranger’s station to the camp site is about 30 miles. From Hwy 38, make a right into Fish Creek Campground, the roads are rocky, high clearance vehicle is recommended, however, we made it in okay with our Mazda Protege. 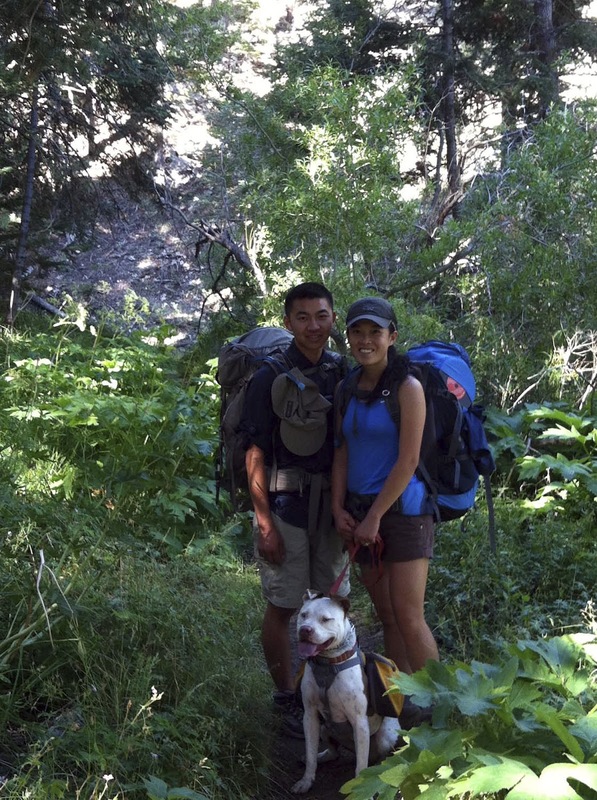 The elevation at Fish Creek is 8160 feet, Louis is prone to altitude changes so he took the hike slow with Dakota. 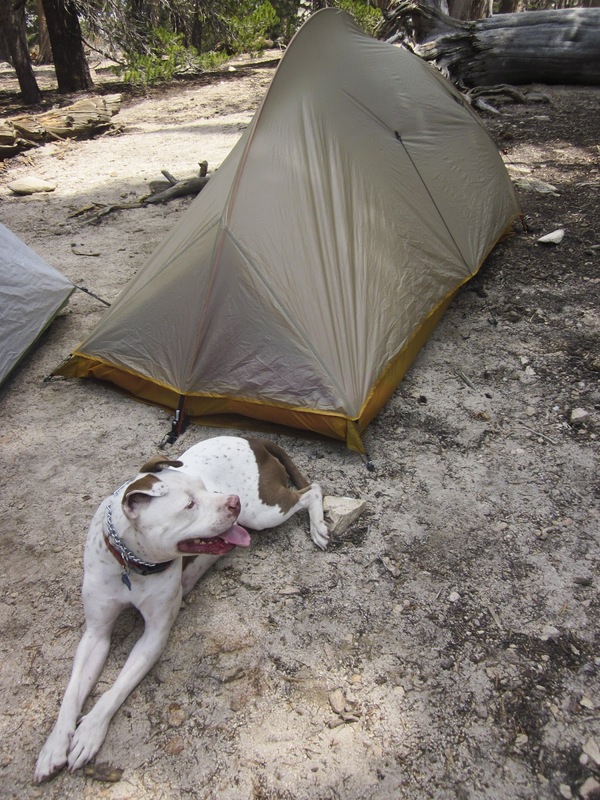 From the parking lot to Fish Creek campground is 2.6 miles. Water is abundant first week of August within the first 2.6 miles, the hike was easy and the weather was perfect, it took us 1 hour to get to the first camp ground. 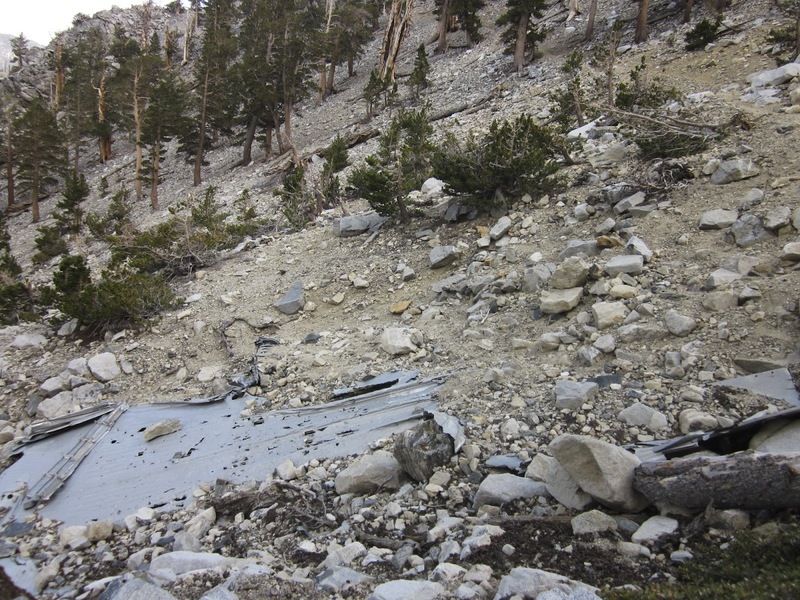 Half a mile from Fish Creek campground to Fish Creek Saddle is the last water supply before Fish Creek Saddle. 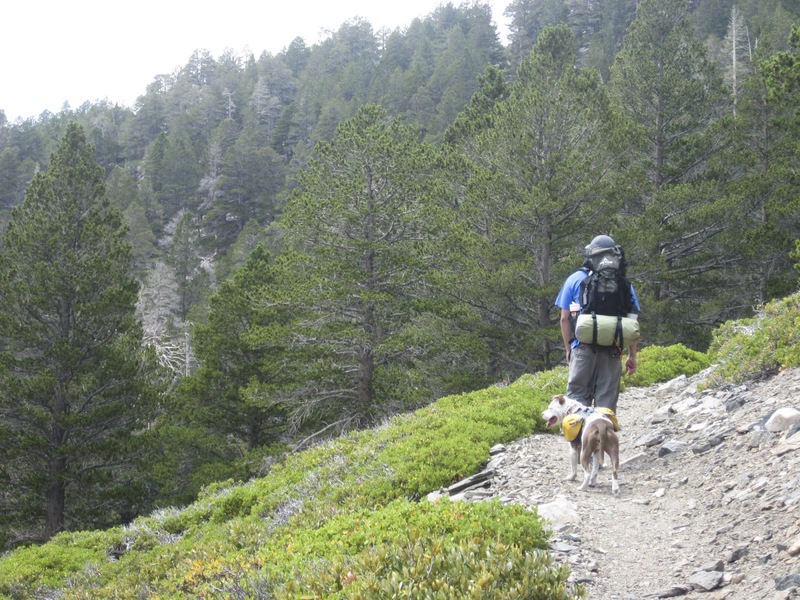 We filled up our water packs full and set out for Fish Creek Saddle. 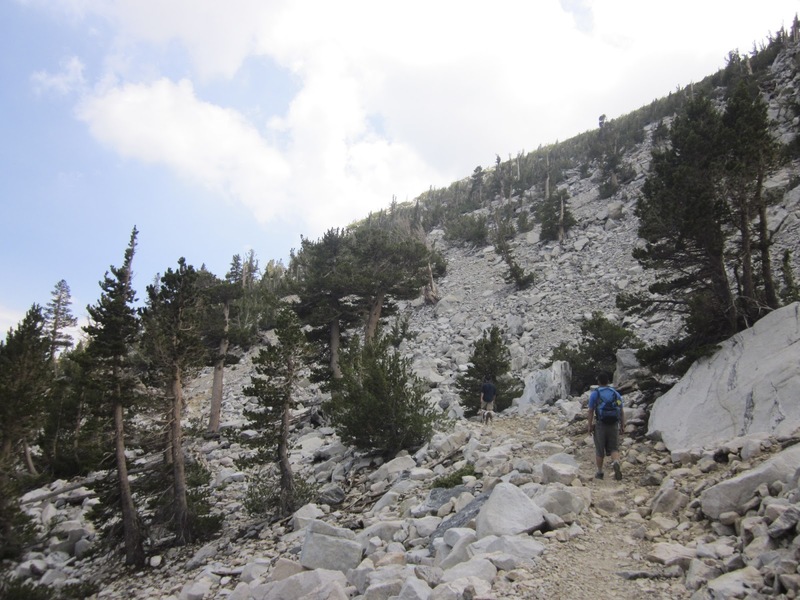 The hike from Fish Creek campground to Fish Creek Saddle was 2.3miles but the altitude gain was tremendous and it felt like a very difficult hike since most of the trails were exposed to sun. We got to Fish Creek Saddle campground around 1:30PM, the next nearest water is on the way to dry lake and the water source looked murky and filled with algae from far away. 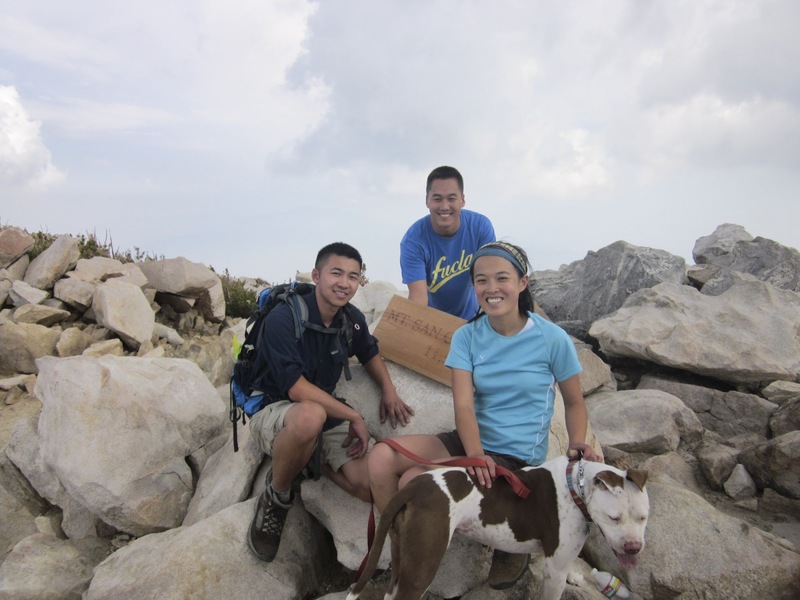 We decided we had enough water between the three of us to climb Mt San G, and opted not to refill at the lake. The beginning of switch backs and climb, we had no idea what we were getting ourselves into! Perfect weather, breezy 70 degrees. On our way to the peak we spotted the1950s military cargo plane crash site. 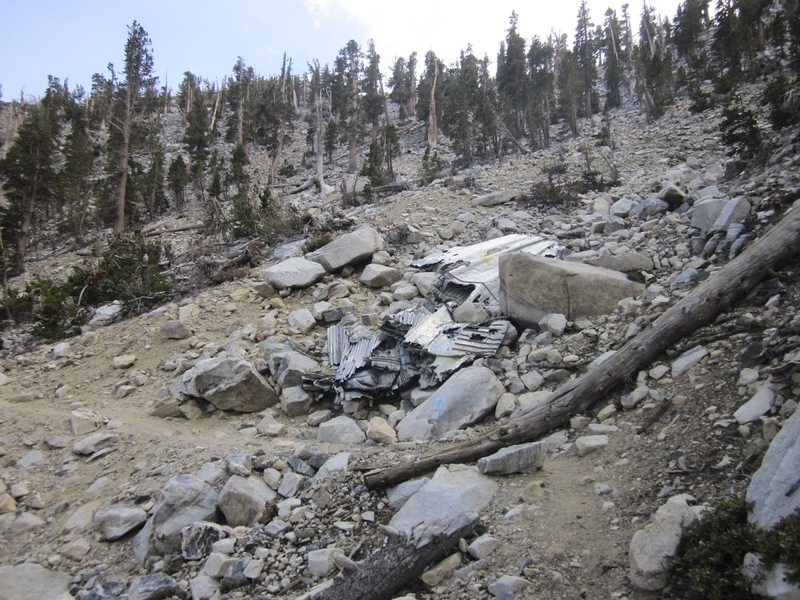 The cost of salvaging the plane was too much, the debris’ been left here at the crash site since the incident. The last half a mile of the hike was tough, the switch backs seemed never ending. Make sure to go right for the peak and follow the sign. Peak photo. 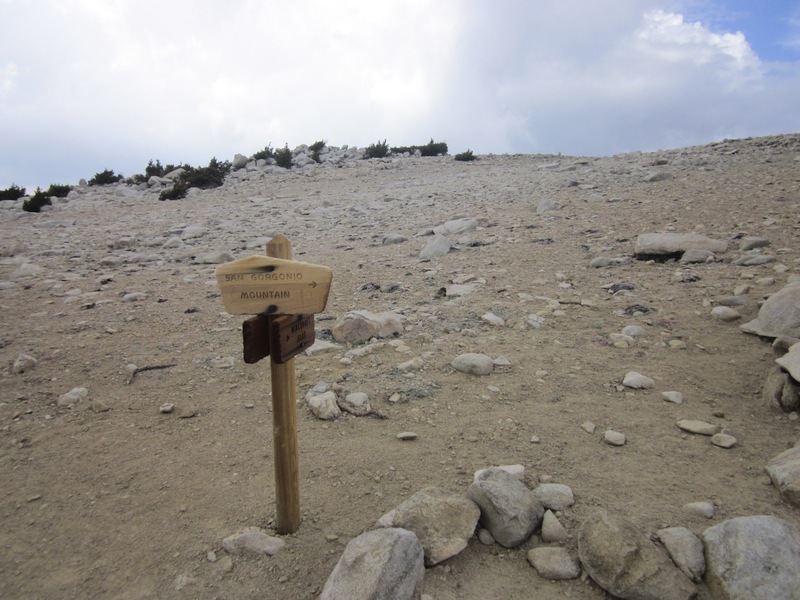 It was 6.5 miles from Fish Creek Saddle to the peak at 11502 feet above mean sea level. Near the top, I definitely felt the altitude and had trouble breathing. We had to slow down our pace considerable. Dakota was too preoccupied by chipmunks to take a good group photo. By the time we got back to our camp site at Fish Creek Saddle it was 7:30PM. It took us 5 hours to hike 13 miles up to the peak, not too shabby. We went to sleep and woke up next morning at 6AM. Because we are running low on water at this point, we skipped breakfast and decided to hike down to Fish Creek camp and refill. The hike down to Fish Creek camp took much less effort and we were out to the parking lot within 2 hours. Once last family photo before the parking lot. 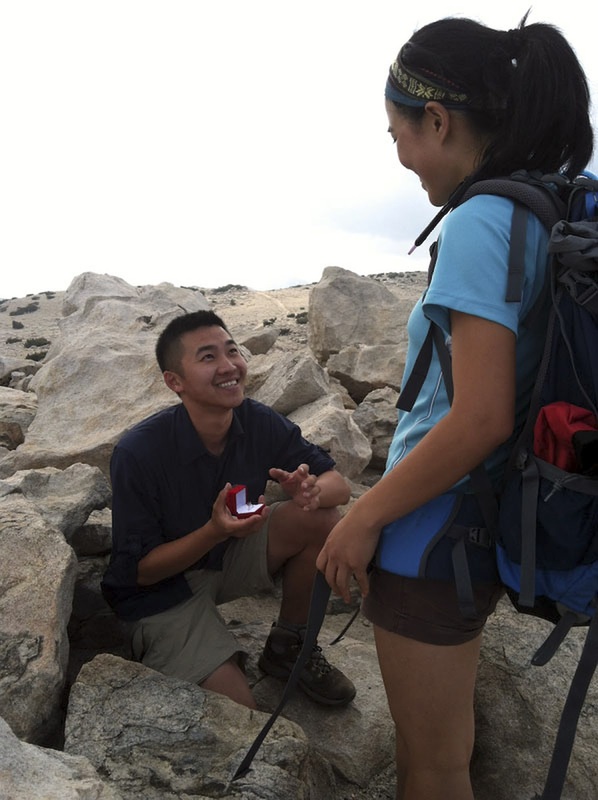 This entry was posted in Trail Reports and tagged backpacking, camping, Hiking, Mt. San Gorgonio, San Bernardino National Forest by hikenoworklater. Bookmark the permalink. 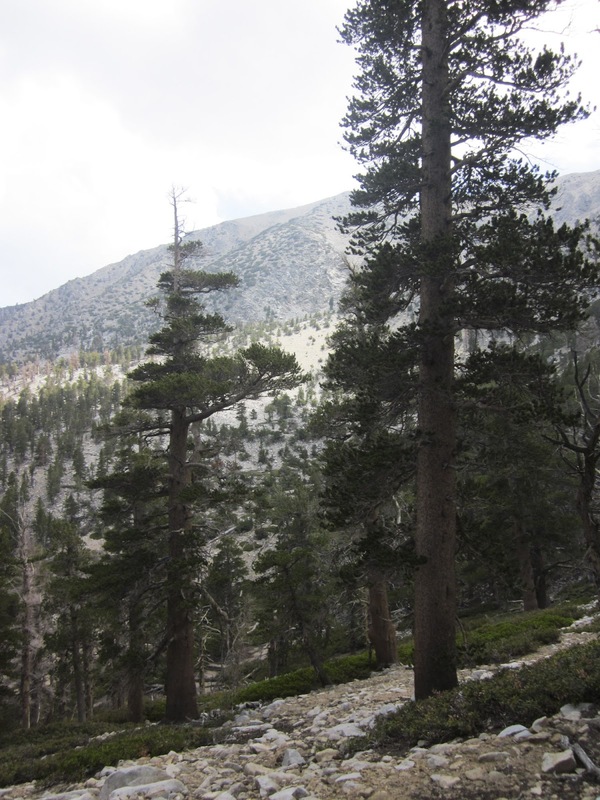 San Gorgonio is fantastic. I spent the night on the summit just over a week ago. I haven’t been to Fish Creek yet. Nice to get a preview. We have climbed it twice: once in February (Snow covered) and in August. It was beautiful either way. Did you climb it up Vivian Creek? Yes, climbed up Vivian Creek. 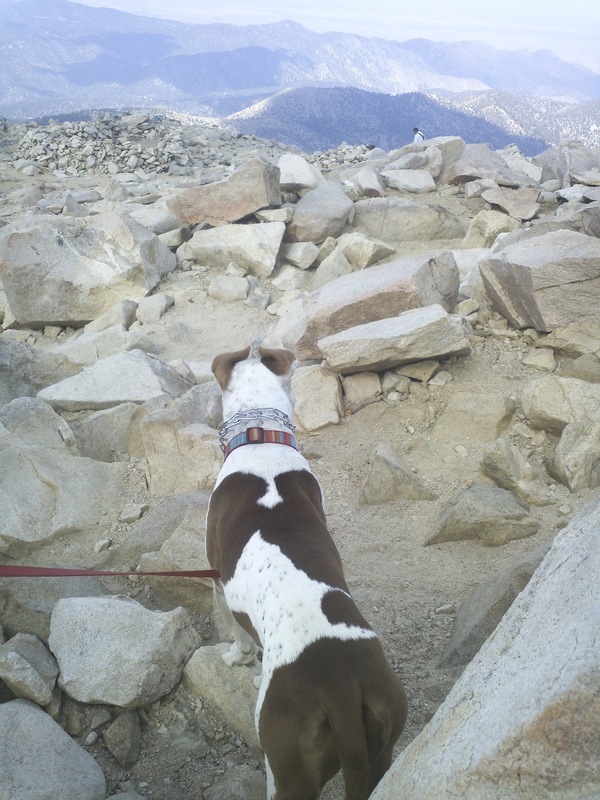 After spending the night on the summit I went down the Sky High Trail to Dry Lake and met a friend. We left via the South Fork Trail so I got to do a traverse.